Four months from November means that the reports are due next month. I don’t see this as pessimistic as you do. Once we extend our presence to the orbit around another planetary body, going down to the surface is just a small step (especially on a low gravity body without atmosphere like the moon). Yes, the lunar orbit station/platform/gateway and especially SLS/Orion is eating the budget to develop a manned lander for surface missions, but I’m pretty sure those things will change at some time. Yes, SLS/Orion is strongly anchored in the language surrounding the lunar station, but since commercial services (and international partners) are included in the whole thing right from the beginning, I expect those will grow to an ever bigger contribution and SLS will be dropped at some point. With Falcon Heavy now operational and New Glenn and even BFR on the horizon, the days of SLS are numbered imho. I compare an orbital outpost to something like a base camp at Mt. Everest. Going directly to the surface without an orbital outpost is neither sustainable nor scalable. Just like climbing Mt. Everest without a base camp would never be the “cheap tourist attraction” that it is today. Coffee is a great drink in the AM. Nope. Main problems to solve are: ongoing political resolve and funding. Cool. Now go build it. SpaceX will solve the technical problems with its BFS moon lander. The only benefit this moon toll booth offers is possible a job where SpaceX could make profit servicing it like it now does ISS. Falcon heavy laundry, food service. When a lander becomes available, why couldn’t a payload launched from Earth dock directly with the lander nullifying the need for the DSG? And if there is no need for the DSG to get crew and cargo to the surface of the Moon then what of the argument that it would be a great launching point for commercial partners? Does it not make sense to have a safe haven spot? Someplace for storage, O2, etc? If someone on the lunar surface becomes sick or injured, shouldn’t the base have medical capabilities? If so, why should a DSG have better medical capabilities than on the lunar surface where most crew should be? If anything, crew in any orbiting station should evacuate to the growing, shielded, lunar surface safe haven. If sick or injured crew need more medical care than the base could provide, then they ought to be shipped to Earth rather than imagine building up some sort of incredible medical facilities at a DSG. There are no plans to do that. For sending cargo and crew to the Moon, standardized shipping modules should be used and those modules should be handed from incoming and outgoing vehicles on a one-to-one basis. It is logistics inefficiency to build up and maintain a lot of O2 at a DSG when one only needs a craft’s worth of O2 at a time. Better to schedule Earth launches and lunar ferries to arrive at the same time at a rendezvous point and hand over a module rather than have to build up, hang out, and maintain propellant, cargo, or crew in lunar orbit. Rather, get the cargo and crew to where they need to be — the lunar surface. Now, the case for stockpiling before a Mars mission may have some merit because Mars missions require more mass and therefore some accumulation before departure may be necessary. But why not make that accumulation point LEO as has been conceived for several Mars mission architectures? LEO is easier than lunar orbit and would allow vehicles such as FH to be utilized to their max to reduce the cost of the Mars missions. Also, a legitimate architecture, the BFR, requires no cis-lunar station. Are we sure that the DSG is actually necessary for either the Moon or Mars. Since it will be so expensive and delay going to the surface if the Moon, we ought to make sure that it is actually needed. But DSG/LOPG will be only very occasionally occupied, so what resupply problem? See? The giant intellects at NASA think of everything! Very churlish of you to doubt them, sir! That’s perhaps my main beef with the DSG. Aside from the rather big one one of it not actually equating to a return to the Moon, it apparently won’t even be occupied full time. Yes, there is still stuff to learn from constructing and operating something out that far, and unexpected spinoffs might emerge such as has been happening with ISS, but they won’t even be dealing with the main issues it would solve if it were to be a Mars precursor — long term radiation exposure, closed loop (or at least more closed) life support, dealing mostly with only what you bring plus pre-positioned supplies, and significant communication delay. Meanwhile, as a Moon precursor, it’s unnecessary as has already been proven by Apollo. For Mars, it seems to say that NASA thinks we’re still decades away from being ready — and they may be right. The original schedule of “the mid 2030s” (itself apt to slip) would leave us about 20 years out from the vicinity of Mars (15 if no slip, but we just re-directed toward the Moon, so — slip). For Mars, DSG is a real baby step (though it is a step). For the Moon, it seems almost more like a combination of a delaying tactic and appeasement to some of NASA’s masters in congress and the contractor base. Perhaps most of all, it’s just inertia — they were going to build a DSG on The Journey To Mars, now they’ll build it on The Return To The Moon To Stay. Congress will get something for their SLS to do, commercial space and international partners will get thrown contributing jobs, no one will get too upset, it’s not too risky, they’ll learn a few lesson towards Mars to be used if the next president re-directs them back to Mars, and if Trump is re-elected they may get to start on a lunar lander and be close enough to accomplishing that that the following president will want to see it through. Everything starts as a series of boondoggles. I say pizza delivery within 3 days or it’s free. It needs to be Gateway – Lunar Orbiting Platform. GLOP. This makes perfect sense for a space program afraid to fly. You get to sink all the money on the ground into building and launching the hardware. Then, once in orbit, you need not put people on it, but you can if you want to. It sounds silly if you’re a flags, footprints, and industry type. But look at it from the government program’s point of view. 1 They’re doing just fine now at the current flight rate and risk profile, thank you. 2 it is a step out of LEO, and they’re willing to commit to it. That’s something. NASA should just wait for the better, bigger and cheaper version of the DSG concept from the Hawthorne folks. Especially since the BFR & BFS combo will be operational at about the same time as the planned DSG. The BFS can act as transport to lunar orbit. Become the a long term orbital station and/or propellant depot once in Lunar orbit. The BFS is a very heavy Lunar lander if stage from lunar orbit otherwise can only get about a “measly” 50 metric tons to the Lunar surface with a direct deployment from Earth (according to NSF forum chatter). Of course there will some sort of EVA airlock on a spaceship the size of a BFS. My view is that the whole DSG concept is make work for the SLS. Which have no other payloads other than the Orion and the “Earmarked” Europa Clipper. Especially since the components of the planned DSG are derived from the SLS and are also delivered to Lunar orbit by the SLS. The problem is that it will only be sasafe haven for that small band of the Moon under its orbit. And if you launch at the wrong time you will not reach it without burning s lot of fuel, maybe too much. Unlike the CSM with the LM, the DSG will not be able to go after you if your Orbit is too low. In short it’s a space station that is looking for a mission just as the SLS/Orion are looking for a payload. Just drop the Gateway as it’s a gateway to nowhere. Then’s it LOP, like lop the LOP out of the budget. 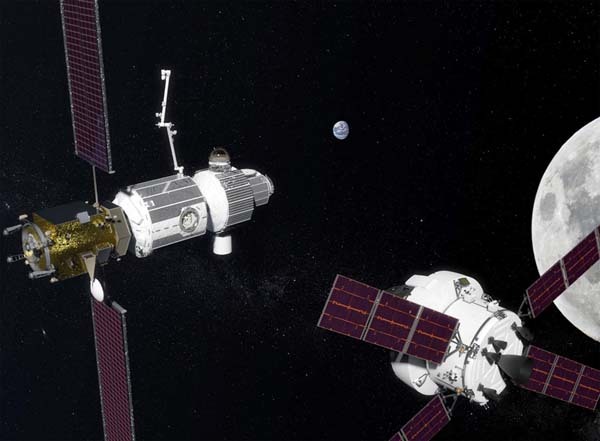 So maybe only 3 crewed SLS missions are needed, delivery of the habitation module in 2023, the logistics module in 2024, and the airlock in 2025. Hopefully by then SLS can be retired and the BFR can take over all crew and cargo missions. Yeah, but after GLOP I thought we could go for Delayed Orbital Lunar Landing Program -or- DOLLOP. Frozen water at the lunar poles (use laser cutters), plenty of oxygen can be extracted from lunar dust (high temperature electrolysis), sterilized astronaut feces for fertilizer mixed with dust, PRESTO! Grow potatoes, corn, veggies, legumes and fruit (strawberries, pineapples, etc) in a large geodesic dome greenhouse at the high lunar latitudes (60 – 90 degrees N or S). Ohhh! Two more benefits from setting up a base/settlement at the high (or low) lunar latitudes: (1) good protection from solar flares for surface dwellings with high horseshoe-shaped regolith berms/dikes around them. (2) shorter distance to the farside than from the lunar equator. I like your Everest analogy, but then base camp is surely LEO – lunar orbit is the South Col. I already have a solution for that, and I don’t have a PhD in engineering. The solutions are really simple. And about toilet paper? Greenhouse plant fibers chemically treated. Yes. We’ve all heard stories of uber-wealthy types who never wear the same clothes – especially underclothes – twice. What most don’t know is that ISS astronauts and cosmonauts have been living this same lifestyle – out of necessity – for nearly 20 years now. I think Maytag, frankly, would be a more indispensable contractor participant in DSG or LOPG or whatever than would any of the legacy aerospace primes. That does seem to be the plan. I do so love me a good heapin’ helpin’ of acronymphomania! Yeah, but I screwed it up …. What I really mean’t to say was …. Delayed Orbital Lunar Landing and Operations Program. …. I was in such a rush…. I think a non-overtrained astronaut tinkerer could figure out a laundry solution in a few hours if the culture permitted. Think pressure cleaner instead of Maytag. Since the first SLS test flight with the uncrewed Orion have slipped to no earlier than sometime in 2020. More likely no earlier than 2024 for the first Orion with crew to fly around the Moon with the first DSG component deployment. Which is the PPE module. By the way there is only enough RS-25 main engines and SRB steel casing sections for 4 SLS flights. Also the Orion service module’s OMS engines only have enough stock to support 5 flights. Additional supply of said engines requires setting up new production lines. The SRB have to be replace with new SRB design with composite casings since the SRB steel casing section production cease with the dismantling of the foundry that produce them. The SLS needs a significant increase to the NASA budget by about $3B annually to get more than 4 flights no later than FY2020. Also none of the DSG components requires the SLS to be place in Lunar orbit. The only reason for the SLS is the Orion capsule. So more likely only the SLS Block 1 test flight and maybe the first SLS Block 1B crewed flight before the SLS programme gets the budgetary Axe. lunar orbit is the South Col.
Or even the Hillary Step. Just a rest stop before the final push. I really don’t see Aerospike’s reasoning. The Everest base camp (and the other camps, like the South Col) are there to allow the climbers to acclimate and to store supplies. There’s nothing about lunar orbit that makes it a necessary stop. A lander might meet an orbiter-ship/capsule from Earth in LLO, but there’s no requirements for any permanent infrastructure in lunar orbit. Supporting that infrastructure just wastes resources. The DSH is proposed because NASA can’t do anything else. They don’t have a lander, or funding for one. They don’t have true deep space capability. And they don’t have any practical funded mission goal. Just vague hand-waving about “back to the moon”. Domes are a bad choice for a pressure vessel on a low-pressure body like the moon (or Mars). There is 10 tonnes of internal force per square-metre of dome area focused on the dome’s rim, trying to rip it off its foundations. The issues involved in solving that require more infrastructure than just using closed properly-shaped pressure vessels. in a large geodesic dome greenhouse at the high lunar latitudes (60 – 90 degrees N or S). Assuming you mean a greenhouse with windows, unless it’s on one of the peaks of (near) eternal sunlight, it would be difficult to insulate an exposed geodesic shell during the lunar night. Mmmm, no, I don’t think so. Something combined-washer-and-dryer-ish involving ultrasonics and microwaves along with mechanical agitation would seem better for the normative longevity of clothing items. Pressure washers are pretty rough. Not good to prematurely wear the clothes out with the laundry process. Defeats part of the purpose of keeping resupply requirements to a minimum. I presume you mean “interesting” in the apocryphal Chinese proverb sense. Yes, they are. It would certainly be nice if we’d already learned a lot more about working with them in zero-G than we seem to have. One more of many obvious areas for major ISS-based science research – along with fractional-G – that has been too much neglected to-date. No, no certainty. But the entire current plan is based on SLS and Orion. I have one word for you Jake – bidets. The only in-space emergencies involving crew mankind has handled to this point were the Apollo 13 service module explosion and collision and fire incidents on the Salyuts and Mir. I suppose Columbia also counts as an in-space emergency we didn’t handle. In the Salyut and Mir cases, help had to go to the space stations as they could not go to where help was. Apollo 13 would have been the same except the LM constituted, in essence, a backup engine when the SM’s main powerplant was rendered suspect. Had Apollo 8 suffered an Apollo 13-ish failure, the crew would have died and Tom Hanks would have been playing someone else, not Jim Lovell, in the Apollo 13 movie. Bottom line is one cannot count on people in trouble in space being able to get to a single supply cache in a single particular orbit. What’s needed instead is one or more somethings analogous to Coast Guard cutters in space. DSG/LOPG doesn’t qualify as it has no propulsion beyond station-keeping thrusters and no crew the vast majority of the time. A lightly-crewed BFS, though – with an M.D. among its complement – has propulsion for orbit matching with stricken vessels and can carry enough life-support consumables to allow for months-long “patrol” missions in cis-lunar space with enough margin to also support the needs of rescued “mariners in distress.” The crew BFS, after all, is being designed to accommodate 100 or more people on months-long missions to Mars. This isn’t something that would occur to NASA because it seems to be planning for only an extremely mingy minimum of actual human space travel in cis-lunar space. And then there is the still more critical matter that such a solution would not, ala Tom Heppenheimer, keep the right parking lots full. Seems to me I remember a power module also being part of the plan. A DSG/LOPG without power is maybe the only thing I can think of more useless than a DSG/LOPG with power. I was thinking the power module could be brought by a Falcon Heavy. The entire DSG/LOPG thing could be replaced by something much bigger and fancier, the pieces for which could all be brought up on Falcon Heavy – and then BFR – if the plan was to actually build a lunar-orbiting space station that might be of even marginal use. Point is, that’s not the plan. I look forward to this even f no one else does.